He told me that this tattoo is five years old, and the colors are still bright and vibrant, so he is very happy with it. It is a very interesting and creative take on a sugar skull. He credited the work to Hennes Wasserme (@HennesTrueLove), an artist at True Love Tattoo (@TrueLoveTattooDuesseldorf) in Düsseldorf, Germany. Marius told me he likes Hennes' work because he does "good, old-fashioned tattoos," as opposed to the newer art brut style of tattoo that many European artists have embraced. 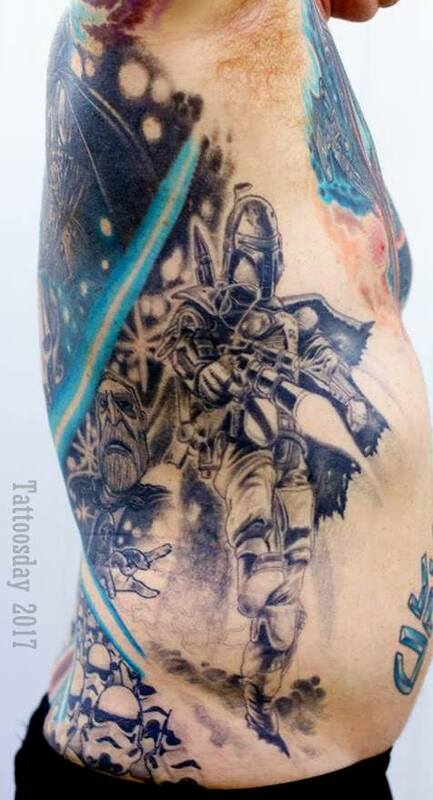 Thanks to Marius for sharing this super cool tattoo with us here on Tattoosday! Correction: An earlier version of this post credited the work to Olaf Lobe (@OlafTrueLove). It has been updated to reflect Hennes Wasserme as the artist. This entry is ©2017 Tattoosday. It only seemed fitting that, on this Memorial Day, we feature a tattoo that honors our men and women in uniform. A week ago, I was fresh off of my experience at the New York City Tattoo Convention, and everything I saw on the street was uninteresting. Until I passed by Mike and did a double-take. Mike explained that, as a United States Marine, he was choosing to honor the corps by building a sleeve of iconic military photographs. "While units of the U.S. Far East Air Forces Combat Cargo Command made an all-out effort to aid embattled units of the First Marine Division and Seventh Infantry Division, the men fighting in Korea were trying desperately to link up in their battle for survival. This marine is shown just as he reached the crest of the ridge at the link-up point. Wet, stinging snow and ice made the operation the most difficult sort, as unleashed hordes of communist troops charge again and again into the United Nations forces. (circa December 1950) "
In addition to this tattoo, Mike has a Vietnam-era photo of a Marine sniper inked on his right biceps. 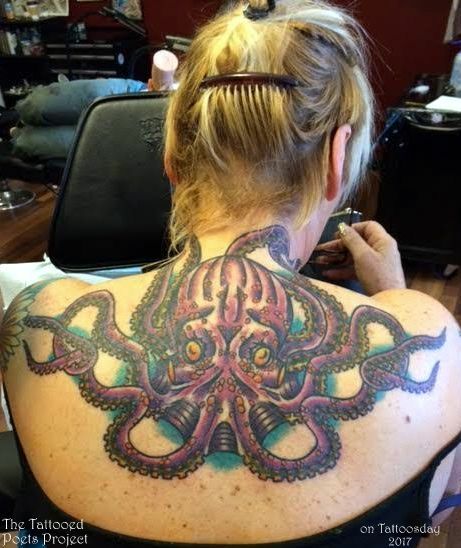 This astonishing tattoo was created by Randy Prause at Permanent Buzz Tattoo, in Denville, New Jersey. 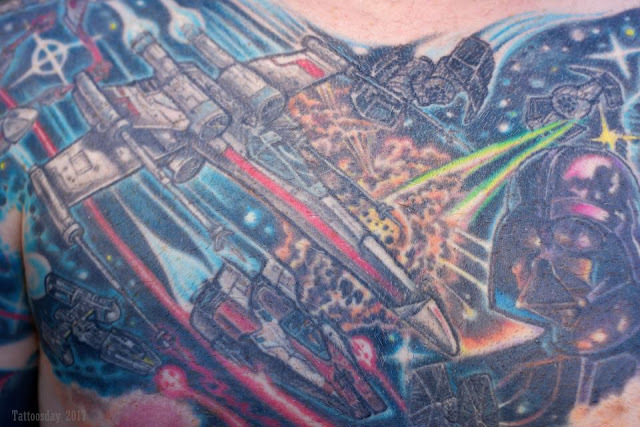 A hearty thanks to Mike for sharing this tattoo with us here on Memorial Day. More importantly, Tattoosday expresses even more gratitude to Mike and all his fellow soldiers and who have so bravely served our country to ensure the freedoms we enjoy each day. Have a safe and pleasant Memorial Day! This entry is © 2009, 2013, 2017 Tattoosday. This cool gypsy tattoo represents luck and was inked by Eddie Peralta (@angryeddie) at Powerhouse Tattoo (@powerhousetattoo) in Montclair, New Jersey. 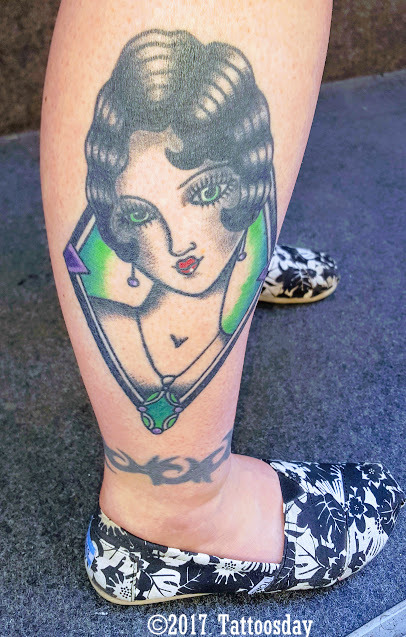 "I love the Twenties," Kris explained, adding that this was done by Anna Waychoff (@annawaychoff), also from Powerhouse Tattoo. 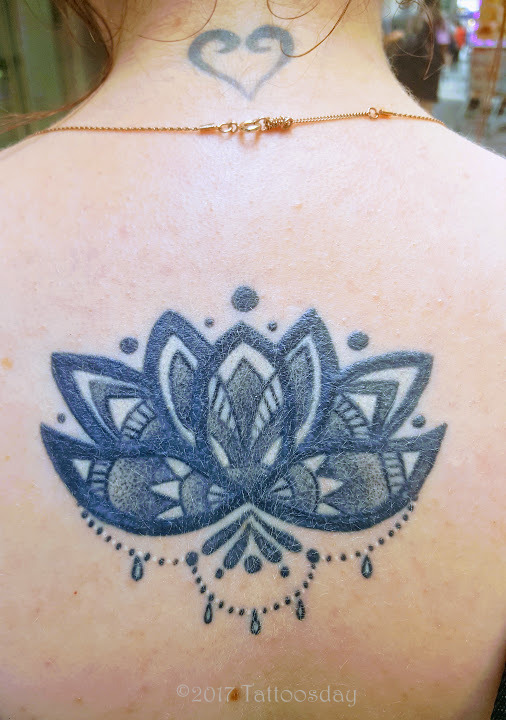 Thanks to Kris for sharing her cool tattoos with us here on Tattoosday! 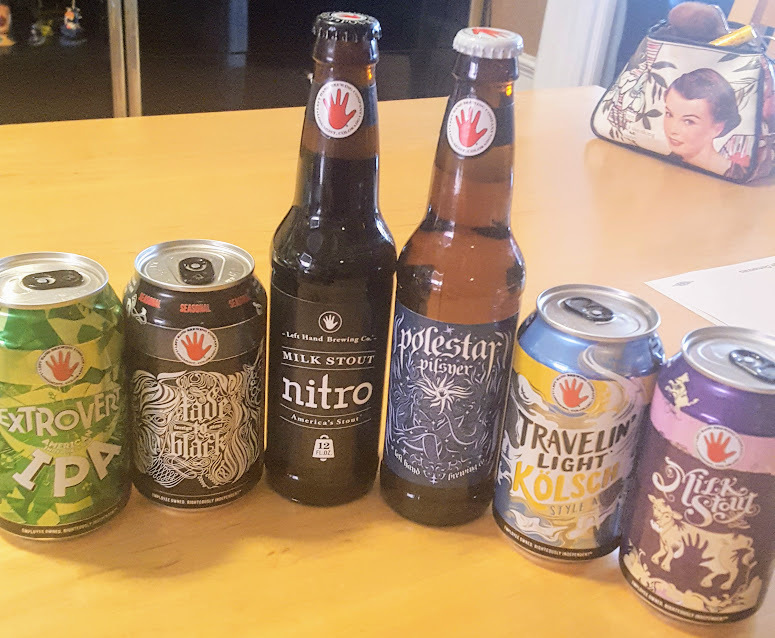 Last summer we launched our Brewsday Tuesday on Tattoosday feature, and we're back with more great tattoos and beer (and a super prize giveaway) from the good folks at Left Hand Brewing (@lefthandbrewing) in Colorado! 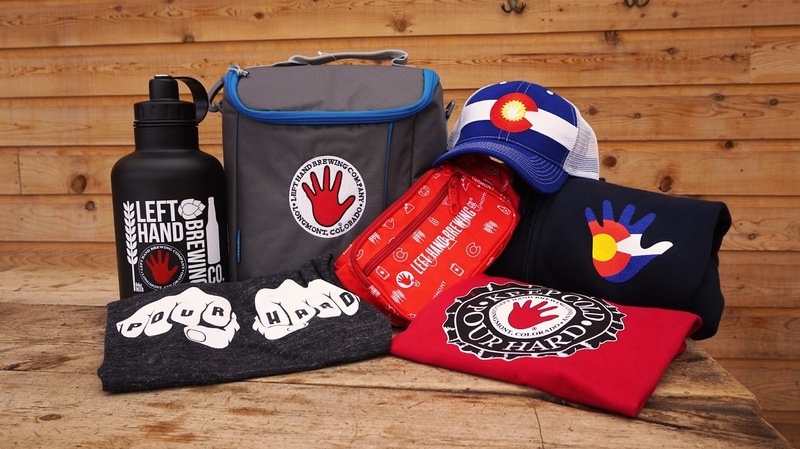 Left Hand was founded in 1993 in Longmont, about 30 miles outside of Denver, and they have been an award-winning brewery ever since, racking up medals and awards and, most importantly, producing great beer. There are some great elements in this half sleeve. Ryan told me that he had been a fan of traditional Japanese tattoo art, but he had been working for a distributor in Kansas that didn't allow tattoos. When he landed the gig at Left Hand, there were no such restrictions, so he celebrated and "went big" with this beautiful tattoo. He credited Ron Miller (@miller.tattoo) at Ichiban Tattoo in Lawrence, Kansas . Ron has since opened his own shop, called Miller Tattoo, also in Lawrence. Ryan told me that this watch in the tattoo is a family heirloom, that was handed down to him when his grandfather passed away. The watch has been in his family since 1888 and, since it's locked away in a safe deposit box, this way he gets to see it every day. He got this as a walk-in at Mercy Seat Tattoo (@mercyseattattoo) in Kansas City, Missouri. Thanks to Ryan for sharing his tattoos, photographed by Kearby Milliner at Left Hand. I had a lot of fun drinking this beer, I can honestly say. I've been a fan of Left Hand's Milk Stout (far right) and, although I tend to favor darker beers, I found the lighter ones, like the Travelin' Light kolsch and the Polestar pilsner, to be crisp and flavorful. The Extrovert IPA is a solid brand with a great hoppiness that stands among the best IPAs out there. The shining gem in this family portrait, for me, however, was their Fade to Black (pictured second from left). This seasonal "foreign stout" is a palate-buster for me, with licorice notes that really made drinking this beer a treat. Ryan told me his favorite brand is the Black Jack porter, which is one of their perennial brews that rocks a great espresso and dark chocolate flavor. Left Hand has a solid lineup and it was a pleasure and honor to partner with them in this celebration of tattoos and brews! This includes, a Nitro Sherpa Hoodie, a Pour Hard Knuckles t-shirt, a Red Pour Hard Nitro t-shirt, a Colorado Trucker Hat, a 64 oz Ecovessel, a Left Hand cooler bag and belt pack! WHAT?! All apparel is size M.
Readers who comment below or on social media will be entered automatically into a random drawing and the winner will get this box of awesomeness shipped to their doorstep. Commenting with your favorite brand from Left Hand will double your chances, as I will count your entry twice. Thanks to all the great people at Left Hand Brewing Company for making this an awesome Brewsday Tuesday! Special thanks to Sarah Watson for coordinating this with me, and to Ryan Call, for sharing his tattoos with us, as well as all the others on the Left Hand team that helped make this post possible. Over the years, I've passed out a lot of cards, hoping to open a dialogue with people about their tattoos, but often never hearing from them again. That's just the way it goes. Occasionally, I will run into them by chance, and we'll be able to connect and put something together. Such is the case with Amber, who I had met and talked to a couple of times a year or two ago at my favorite local beer garden, where she had worked for a very short period of time. Amber credited this great black and gray thigh piece to Nico Negron (@niconegron) from Tattoo Afterlife (@afterlife) in Huntington, New York. She told me it was based on several references and took about seven hours to complete. Thanks to Amber for sharing her amazing tattoo with us here on Tattoosday! Last week on Wall Street, I met Lucy, who was visiting from England, and she was kind enough to share a couple of her tattoos. Lucy explained that this image is from Princess Mononoke, a 1997 Japanese anime classic. 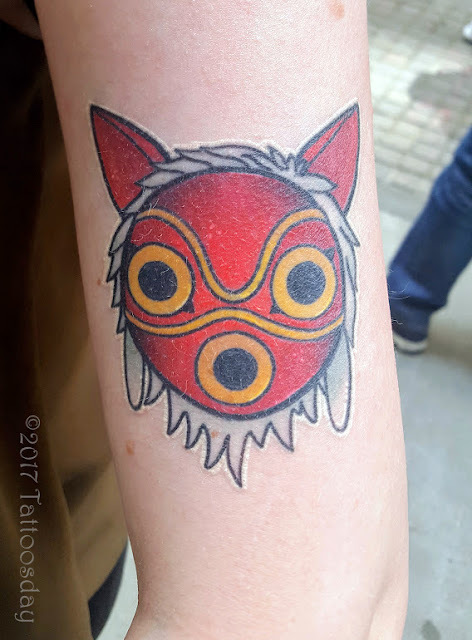 The tattoo is the mask worn by San, otherwise known as Princess Mononoke, who was raised by wolves. This was tattooed by Matt Daniels (@stickypop) from Studio IX in Salford, located in Manchester, England. This was also done at Studio IX, but by artist Emma Louise Dunphy (@emm.dots). Thanks to Lucy for sharing a couple of her tattoos with us here on Tattoosday! Alexis explained that the "Tomb Sweet Tomb" piece is a nod to a feature in The Haunted Mansion attraction at Disney's Magic Kingdom in Orlando. It's her favorite ride and this was inked by Chris Fernandez (@chrisfernandeztattooing) at Kings Avenue Tattoo (@kingsavetattoo) in Manhattan. The heart-shaped piece below it is actually a planchette from a ouija board. This was a Friday the 13th flash tattoo that Alexis got at Grit N Glory Tattoo (@gritnglory) in Manhattan. 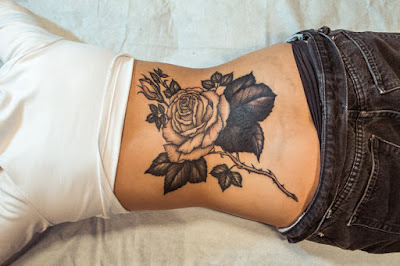 Thanks to lexis for sharing her cool tattoos with us here on Tattoosday! I met Andrea yesterday near Federal Hall in lower Manhattan. 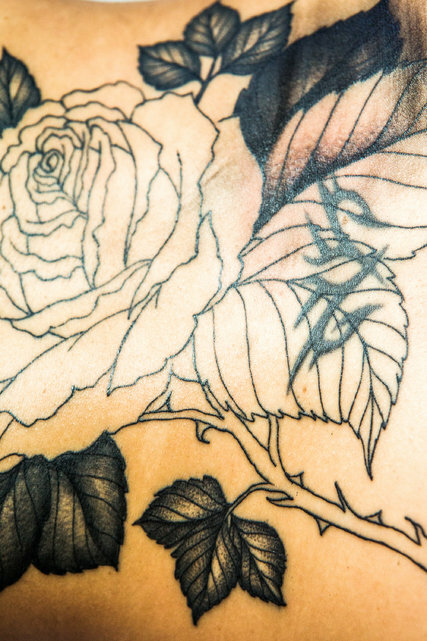 Andrea said that the first rose (pictured, far right) is for her grandmother, but that the other rose, the compass rose, and the moth, are all just part of the design on the arm, art for art's sake. Thanks to Andrea for sharing these awesome tattoos with us here on Tattoosday! Edwardo explained that this is Our Lady of Guadalupe (click on the tag at the end of the post to see other similar tattoos we have featured over the years). He added that this was a cover-up - there had originally been an M-16 inked on his arm, and he joked, if you look carefully, you can barely make out the rifle peeking out from Guadalupe's skirt. Edwardo credited the work to Brazilian artist J.P, Rodrigues (@jprodriguesnyc) from Acqua Santa Tattoo (@acquasantanyc) in Manhattan. Thanks to Edwardo for sharing his beautiful tattoo with us here on Tattoosday! 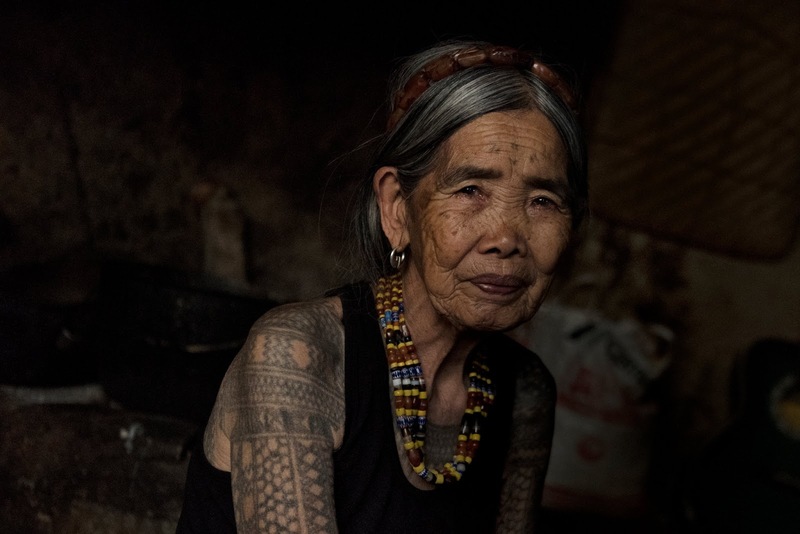 Tattoos are in the news daily, but a few items have popped up in the New York Times that are noteworthy and worth reading. "My best friend Sandrine Schaefer is a performance artist ... she did work where she would use pineapples and cherries on her body, because they're also used as common meat garnishes. And her artwork is a lot about feminism and veganism." Ms. Schaefer, whose website is here, is a prolific artist worth checking out. The tattoo was inked by Lucky Matthews at Fat Ram's Pumpkin Tattoo in the Jamaica Plain section of the greater Boston area. As for the "Mom" tattoo, above it on the forearm, there is really no explanation needed, but I did want to credit the artist, Edwin Marquez at Regeneration Tattoo in Allston, Massachusetts. Thanks to Sean for sharing his ink with us here on Tattoosday! This entry is ©2011, 2017 Tattoosday. This hamsa is on Rachel's inner arm, and was tattooed by Eric Lao (@biggetatz), who currently works out of Sub Q Tattoo in Middletown, New York. The hamsa is a symbol, popular in the Middle East, that is used to ward off the evil eye. This protective amulet is often found in Jewish and Muslim culture. You'll see that the star of David figures prominently in the piece. Rachel says she "saw [the design] on his wall the first time [she] went in for a tattoo." She remembers telling Eric she was going to come back and get it, and she did. 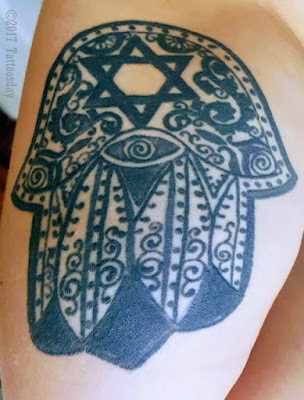 Thanks to Rachel for sharing her cool hamsa tattoo with us here on Tattoosday! I mean, come on! 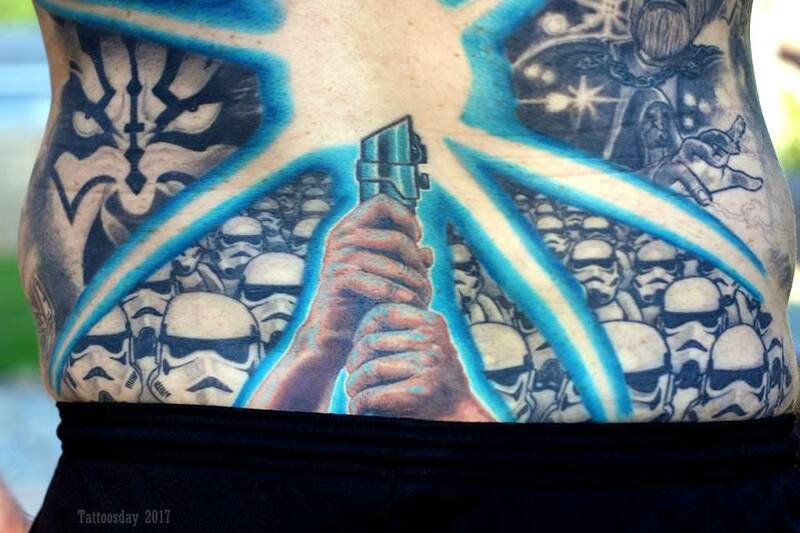 Even a person unfamiliar with the Star Wars universe has to recognize the mastery in this tattoo work. 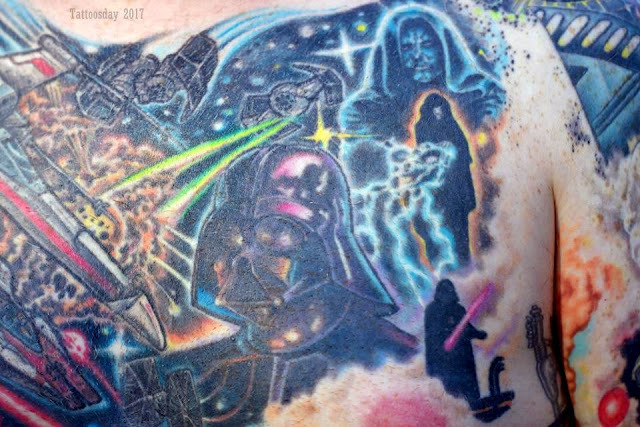 Anthony proudly bears the work of an artist named Needles (@darthneedles), who has done all of his work. He started working with Needles in the early 2000s (perhaps, 2004) and estimates that he has spent 40 hours on the back alone. The chest piece is one of his favorite parts and was named "Best Star Wars Tattoo" in the January/February 2007 issue of Star Wars Insider. Anthony is commanding officer of the Empire City Garrison for the 501st Legion. If you're unaware of what he's referring to, "The Legion is an all-volunteer organization formed for the express purpose of bringing together costume enthusiasts under a collective identity within which to operate." 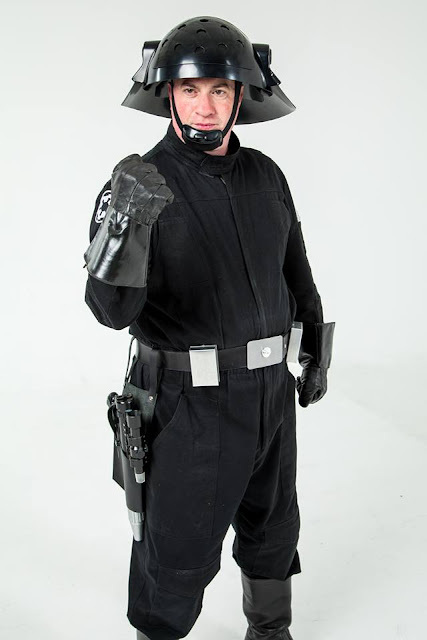 He adds, "The Legion seeks to promote interest in Star Wars through the building and wearing of quality costumes, and to facilitate the use of these costumes for Star Wars-related events as well as contributions to the local community through costumed charity and volunteer work...". The Empire City Garrison is the New York branch of this organization with outposts in multiple states and on several continents. 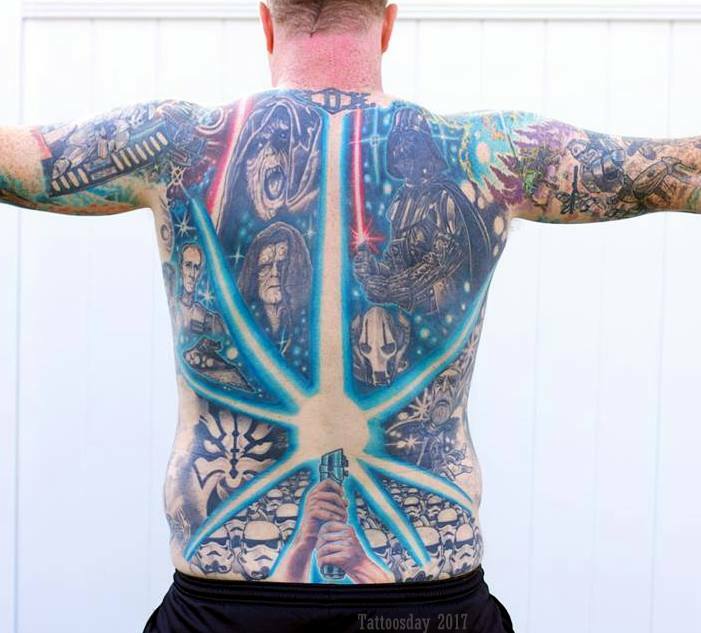 Anthony's work is astounding, when viewed in its entirety and he likens his collection of body art to "the Star Wars journey through tattoos. : His favorite part? "The fact that [it] is on me forever," he says. Thanks to Anthony for sharing his amazing work with us here on Tattoosday! This entry is ©2017 Tattoosday. The photos were published with the permission of Anthony Paladino. Natasha first appeared on Tattoosday back in 2012 here. Natasha was our first New Zealand poet, but she has relocated to Oakland, California and recently got this phenomenal piece from Jeramie Hamilton (@thethickwillstick) at Scholar Tattoo (@scholartattoo_sf) in San Francisco. She notes that "the tentacles come right around as if to attempt to wrap around my neck." 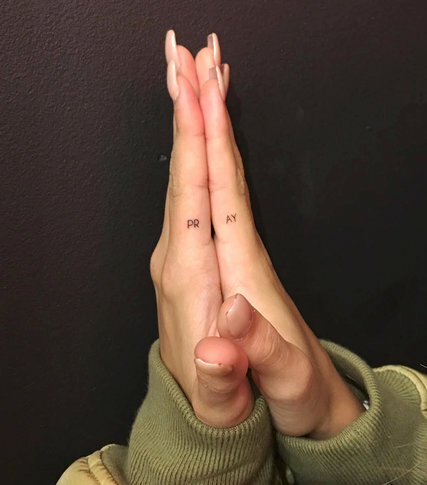 She shared the following poem, which she feels is a good companion to this tattoo. The poem, "Clifftop," is from her collection Anatomize from Norfolk Press. She collaborated often with an Australian-born, L.A. artist named Kaye Freeman (@kfreeman1701) and Natasha included a painting Kaye did on piano-roll paper in conjunction with this poem. "This was part of a joint series we did called Skeleton Dreaming," she told us. floor, where currents pass through me and gently carress me. You can read more about Natasha Dennerstein here. Thank to Natasha for sharing her wonderful poem and tattoo with us here on Tattoosday's Tattooed Poets Project! 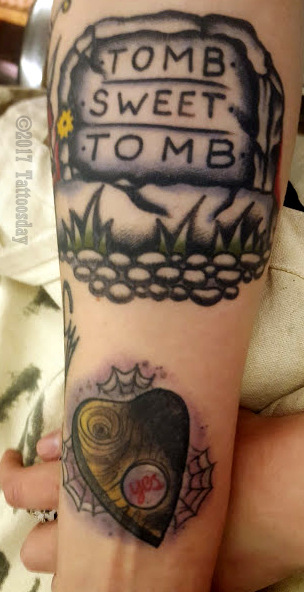 This entry is ©2017 Tattoosday. The poem and tattoo are reprinted with the poet's permission.